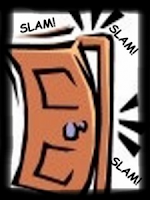 It seems that God must sometimes slam your toes in the door when He shuts it. At least if you're as strong-willed as me and my husband. We just learned this through our "attempt" to move to North Carolina. We truly believed this was God's will for us when we started this venture. Moving is something we've wanted for a while now, and we've tried multiple times. Always, we would ask God if this open door was the one we should step through. We would also ask that the door be closed if it was not. And every time, it closed before we took any action. We waited, and prayed, and hoped the time would come soon. And then this opportunity. I won't give any details other than it was supposed to be a transfer within my husband's company. As usual, we prayed before making any decisions. The door stayed open. We took a trip up and even put our house on the market--got our toes through that open door. And then a few snags. And a few more as the door began to swing. We realized we'd better get our toes out of the way before the door slammed shut with us on the wrong side of it. I am disappointed. North Carolina is beautiful. But there must be something meant for us here. At least for a while. It took a lot to get that message across to us. Our hearts yearn for another place--a place with hills, seasons, snow--and with each closed door we thought it was just not time yet. And that may be true; there may be a move in our future eventually. But not now. No more trying to slip through the door for a while. We get the message, toes bruised but, thank God, intact. Ouch, disappointing for sure. I stand with you as you wait for the new place. . .I wait with you where you are. Write, live, love and share it with us. The move is probably right around the corner!